PrestaShop supports Right-to-Left (RTL) languages natively, both in the Back Office and the Front Office. It can automatically transform themes to make them compatible with RTL languages. Any Front Office theme can be transformed automatically by PrestaShop. Read “RTL support” in the Themes section to learn more about this system. The Back Office uses the same “theme-flipping” system as the Front Office feature. 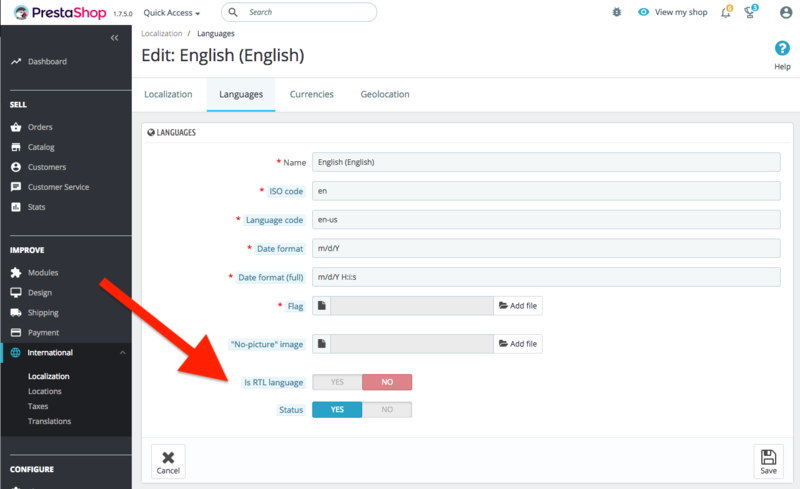 While for Front Office themes the transformation procedure must be triggered manually, in the BO this is performed automatically whenever an RTL language is activated on the shop, either by installing an RTL language or by setting up a language as RTL via edit in the BO. This assumes you have read the “RTL support” article linked above. Remember that PrestaShop won’t overwrite already existing files. You need to delete the files you want to regenerate beforehand. First, delete the _rtl.css file you want to regenerate. Go to International > Localization, then click the “Languages” tab. Toggle the “Is RTL language” (see figure below) to “Yes” and save. If the language was already RTL, toggle it to “No” and save before changing it back to “Yes”.